Yes! Acupuncture is used by millions of Americans every year. 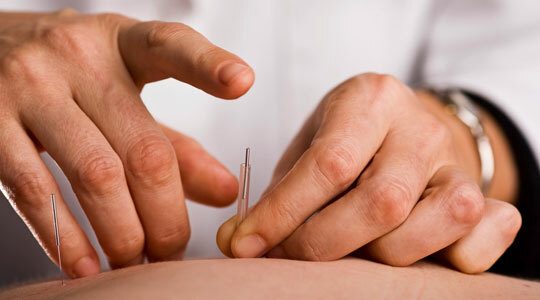 Acupuncturists are required to undergo extensive education, including detailed study of human anatomy and training in "Clean Needle Technique". I have passed comprehensive national board examinations administered by the National Certification Commission for Acupuncture and Oriental Medicine (NCCAOM) and am licensed by the state of Wisconsin. As required by law, I use pre-sterilized, disposable, single-use needles to ensure your complete safety. I gently stimulate the needles they may produce a unique sensation that Oriental medicine calls de qi. Patients often describe de qi as a heavy, achy pressure, or spreading traveling feeling. You may also feel an "electrical" sensation moving down the meridian pathways, though this is less common. Most patients find these acupuncture sensations deeply satisfying and leave the treatment feeling relaxed both mentally and physically. The number and frequency of treatments will vary from patient to patient since everyone is unique in their health care needs. The benefits of acupuncture are cumulative. Some symptoms may be relieved after the first visit, while others may take five to ten treatments. When a specific issue is being addressed, you may be advised to visit the acupuncturist once or twice a week and then gradually reduce the frequency to once or twice a month. Preventative treatments and treatments for general well-being may also be scheduled on an as-needed basis. You may want to make these appointments to coincide with the changes in nature's cycle: spring, fall, winter and summer. Your first visit will take approximatly 2 to 2.5 hours and about 1 hour to 1 and 15 minutes for any thereafter. When you arrive for your first acupuncture appointment I will ask you to complete a comprehensive intake form. The acupuncture intake form asks questions about your current state of health, past illnesses, and family history. These questions are important because the holistic approach of Oriental medicine takes everything into account. Your current symptoms may not seem related to past health issues, but our bodies are complex landscapes and everything that happens to them leaves its mark. to fall asleep during this time. Acupuncture and Traditional Chinese Medicine recognize a subtle energy system by which "qi" is circulated through the body. This transportation system is referred to as the channels or meridians. This understanding has been the foundation of the practice of acupuncture for several thousand years. Chinese medical theories are based on the concept of qi or, as some call it, life force or vital energy. There are twelve principle meridians, each connecting with a major organ system. To better visualize the concept of qi, and the meridians, think of the meridians as a river-bed, over which water flows and irrigates the land; feeding, nourishing and sustaining the substance through which it flows. (In Western medicine, the concept would be likened to the blood flowing through the circulatory system.) If a dam were placed at any point along the river, the nourishing effect that the water had on the whole river would stop at the point the dam was placed. The same is true in relation to qi and the meridians. When the qi becomes blocked, the rest of the body that was being nourished by the continuous flow now suffers. Illness and disease can result if the flow is not restored. Acupuncture is one tool used to restore the flow of qi, by inserting needles into the acupuncture points (located on the meridians). These insertions are said to clear any residing blockages, or dams, thus freeing the river to better feed the body in its entirety. Scientific research has shown that acupuncture triggers the production of endorphins, the body's natural painkillers. It has also been shown to positively affect the endocrine and nervous systems, helping the body achieve physical and emotional well being. It is believed that the earliest acupuncture needles were sharp pieces of bone or flint called bian stones. 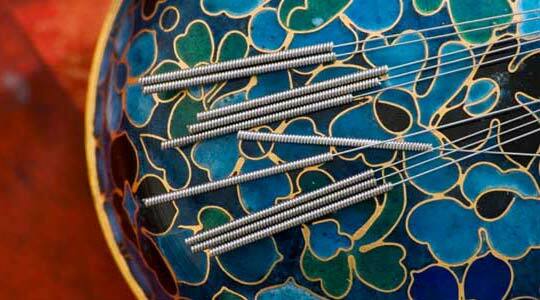 Early acupuncture needles were made from iron, copper, bronze, and even silver or gold. During the Iron and Bronze Ages, metal acupuncture needles began to surface. However, it is not unusual for contemporary acupuncturists to employ gold acupuncture needles to treat certain ailments. The needles employed by acupuncturists today are stainless steel, solid (unlike standard needles used for drawing blood which are hollow) and vary in size or width gauge. Acupuncture needles consist of a stainless steel shaft and a handle made out of copper or steel. There are nine types of needles used in acupuncture; however, only six are commonly used. Needles are inserted at points from 15 to 90 degrees in relation to the skin’s surface. Once the needle has been inserted there are a variety of techniques that aid in the stimulation and sensation. The technique used by the acupuncturist will depend on the ailment that is being treated. 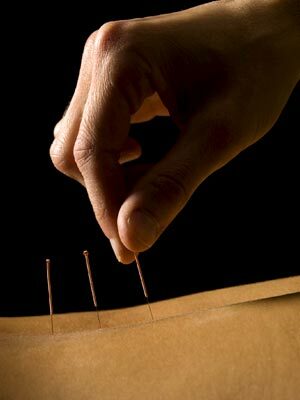 Acupuncture is essentially pain-less, some people may experience a slight pinch as the needle is inserted. Once inserted, the needles remain in place for approximately 20-30 minutes. On March 29, 1996, the Food and Drug Administration bestowed the Class 2 status of "medical tools" to acupuncture needles. Acupuncture needles were previously listed under Class 3, or "experimental devices." The change of classification means that needles used for acupuncture will be subject to FDA approval to ensure quality control and "single use only" labeling. Most significant, the ruling could make acupuncture treatments eligible for coverage under insurance policies which exclude alternative medicine. The FDA ruling indicates that acupuncture is a safe and effective medical treatment. Because modern acupuncture needles are disposable and used only once, there is no risk of transmitting infections from one person to another. can give you an idea of what to expect. With a little patience and an open mind, you'll be on your way to health and vitality.